App Metrics supports filtering metrics on various properties such as Metric Type, Tags, Context and Name. Filtering can be applied either globally, when retrieving a snapshot of metrics or for a specific reporter. A metrics filter can be applied on the IMetricsBuilder which will be applied by default when retrieving metric snapshots. App Metrics supports filtering metrics for specific reporters which could be useful to report a subset metrics to different sources. The following example reports all metrics in the Console context to System.Console and metrics in the TextFile context to a text file. 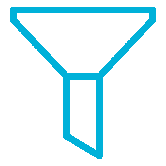 A default implementation of IFilterMetrics is provided to filter metrics, create an instance of MetricsFilter. Metrics can be grouped into Contexts which can be useful in organizing metrics. All metrics are required to be labelled with a Name. Several metric types are supported by App Metrics. Metric tagging is very useful when reporting to a time series database allowing querying and aggregating by various dimensions straightforward. App Metrics supports filtering metrics on tags by matching tag key(s) and tag key/value pairs.